Ok, everybody are you doing "token summoning" for blue essences? Already got one epic - from two summonings, have not much tokens, sigh.. Tried three times, but nothing. I'm reserving tokens a bit. Anybody, did you encountered Crosses in market? Empire/King? I actually don't remember ever seeing them here. Ankhs, you mean? I cannot be sure. But it feels not unlikely. I don't think I ever. Best is to farm GW in a difficulty where you can get 100% survival bonus. I need to farm HEALER, uhm, tomes? Not the fancy golden book ones, the black ones which we use to change the role of our units? It's needed to upgrade the Library, and it's missing 1. Oddly, I had around 20-50 of all others, but his one I had only 8 or 9. Yeah the dark ones you can farm on low difficulties. It's normal that there is always some mat you will miss more than other, since you will have some priority to evolve certain types of creatures over others. Last edited by Galaad on Mar 19 2018, 18:32, edited 1 time in total. How often does this happen? Might be the second time I get that quantity instead of the usual 7 diamonds. Well, it's random. When having Bunny's Quest it happened to me like in each fourth, so high chance. I thought the achievements for fully awakening Bosses is too damn low rewarding. 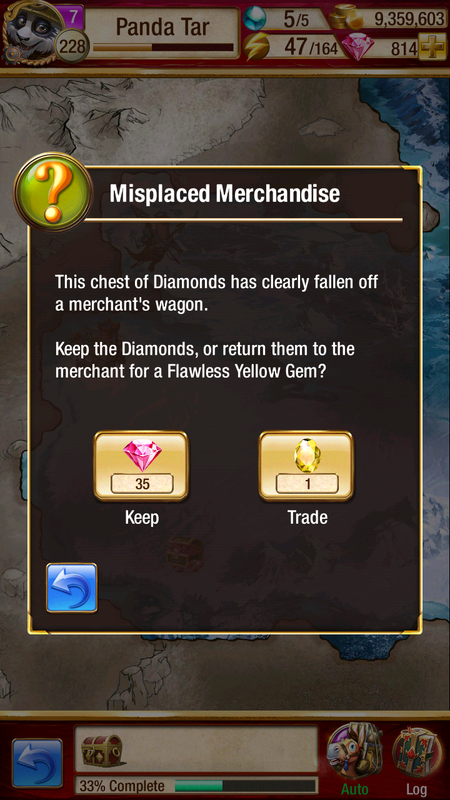 Going normally in the game, without spending money, it'll take you a reaaaaaaally long while to have 1 fully awaken for what, 15 diamonds? Pff. First time I used Gold Enchant and received 97% to critical damage, that is called "Wrath of the Shark III." And it will be a small suprise in one of my Dungeons..
Last edited by Pol on Apr 20 2018, 9:50, edited 2 times in total. Panda Tar wrote: it'll take you a reaaaaaaally long while to have 1 fully awaken for what, 15 diamonds? Yes, considering that you'll likely get 1 or 2 more of the same creature, 13-14 legendary essences for full awakening. Which can only be acquired by tower 49, top 1% tower, top DC, and the final Kingdom battles. I think Leg essences and totems are the true currency of the game. Ok, the lowest Gold Enchant was about: 100k of Wood, 10 Enchanted Ironbank, 4 Compendiums, 10 Arcane Dust, 4 Elementalist's Formulas. Definitively it's not so much but, the point is in re-rolling it again and again if you are not lucky.. ..however I was. Well, certainly it must be a bit costy, IF there are chances of being bestowed with powerful enchantments. Only used 1 silver so far, on my Mantis, hohoho. Especially for the Orbs I call it a success. Main motivator were the Essences, finally completed my Naga. Oh, I will wait a bit longer for Castle lvl 25, but that doesn't matter. PS Of course blue essences, that's for what we have a weather now. Last edited by Pol on Jun 13 2018, 18:51, edited 1 time in total. I got 1 Epic Essence opening 3. Didn't try much longer also because need to save for that future lv 25 castle, although I'm still on 21. Last edited by Panda Tar on Jun 13 2018, 20:10, edited 1 time in total. Oh WOW I think you got pretty luck there, especially the essences! Panda wrote: Ah, and 2 or 3 weeks ago, a random blue joker appeared on my kingdom and gave me 1 blue legendary essence. Every time you upgrade your castle a small creature pops up and gives you a colored GE. Last edited by Galaad on Jun 13 2018, 20:48, edited 1 time in total. Every time? After level 20 or something? I think I only got these after cleaning all expansion areas, i.e., when reached 20th. But that matches when I upgraded to 21. Yes, everytime. From lvl 20 up.